Samsung Galaxy S III owners can expect a New Year's upgrade with enhancements to its camera and interface. The Best Face creates composite shots. The "Premium Suite" is a software update to Samsung’s TouchWiz interface for Android, adding support for split-screen apps and a Facebook lock screen ticker as part of the Android Jelly Bean update. It will arrive over the air or via the Samsung Kies sync app sometime between January 8 and 11, but Samsung says the update date will vary with country and carrier. Several upgrades apply to the Samsung Galaxy S III 8-megapixel camera. The Low Light Shot mode will make it easier to shoot night photos. 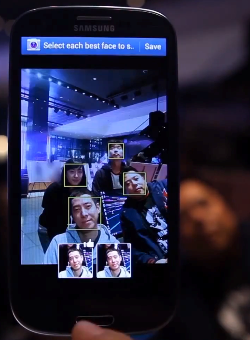 The new Best Face function takes five consecutive group shots and then lets you pick the best face for each person in the photo, creating a composite on the fly (so no one is blinking in the shot). Paper Artist reproduces photos like sketches. Another camera update, Easy Snap, is activated from the phone's accessibility settings to enable the S III to tell you how many faces it detects in the camera preview. The new Paper Artist feature will render a photo like a pencil sketch. The device also supports automatic photo-sharing via NFC. Besides the camera enhancements, the update will also bring a few multimedia features. As with the Galaxy Note II smartphone, the S III will get the multiwindow feature that lets you open two different apps at the same time. The new Reader Mode is similar to Reader in Safari on iOS, which allows you to retrieve just the text and images in an article, without other distractions. Facebook Lock Ticker supplies the news feed. A number of other, smaller changes will appeal to users of the Galaxy S III. The Facebook Lock Ticker supports checking a Facebook news feed straight from the lock screen, and you can simply tap on a status to "like" it right away (this opens the Facebook app). Easy Mode is intended for first-time users, so they can set up the five most-used widgets on the home screen instead of venturing into complex widget set-ups; while Page Buddy can bring up the music player whenever you plug in the headphones. Plenty of customers will be watching for the update; Samsung says it has sold more than 30 million Galaxy S IIIs in the first 150 days of availability, beating the company’s 2012 goal even before the end of the year. Despite some gimmicky features, the Galaxy S III is a well-designed, high-performance smartphone.